McFarlane Toys’ first entry in their Fortnite action figure series, the adorable Cuddle Team Leader, has started hitting GameStop stores ahead of her wave-mates. Earlier this month McFarlane announced their first set of Fortnite 7-inch figures which included the following playable skins from the game: Cuddle Team Leader, Skull Trooper, Black Knight, and Raptor. They are being billed as a “premium” collection, boasting 20+ points of articulation and game-specific accessories. Cuddle Team Leader was sitting there on the pegs at my local GameStop. Upon closer inspection, she had proper double-jointed knees and elbows. Interesting! The articulation scheme didn’t look too bad. The paints were really nice too. Curiosity got the best of me, and $25 later I was on my way home with a fresh new McFarlane Toys action figure. Wow! There is no way in hell that the same company that made Stranger Things Chief Hopper did this. Not only is the articulation scheme excellent, but the build is very strong. The plastic feels nothing like the brittle material McFarlane is known for, it’s all very sturdy. I never once felt like the figure was going to break while posing it. You can definitely see some Eastern influence. The hips are designed to pop out of their sockets, but not break if pushed too far. Each figure in this series comes with a character specific pickaxe, backpack bling, and weapon. The Cuddle Team Leader gets the “Rainbow Smash” pickaxe, a bow for her backpack, and my son tells me that the gun is a SCAR, which seems right to me! The peg for the backpack bow was a little large and hard to jam in, so I did have to heat it up a bit. While this figure is absolutely fantastic, there are a few hiccups here and there. First off, my unicorn pick-axe came missing its horn! It wasn’t flopping about in the box, so it must have just never been put on the thing. This one isn’t a huge deal to me because I still think the accessory looks cool without it. The articulation and build is light years ahead of what McFarlane Toys was doing, well, even earlier this year, but the ankles could be improved. She would probably benefit more from a Marvel Legends style rocker joint. The ball joint at the ankle works in this case because they made it super tight, but it does make that area harder to mess around with. 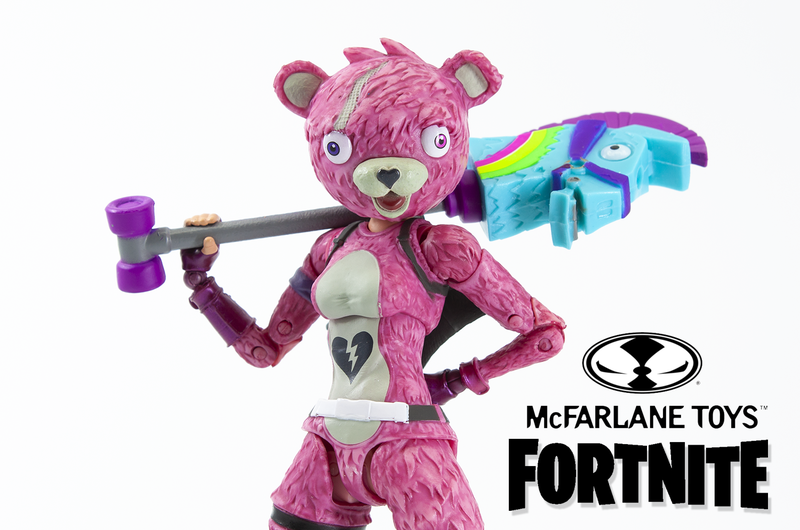 Would I suggest McFarlane Toys Fortnite Cuddle Team Leader? I’m all in on this line! I don’t play Fortnite much, but I love me some video game action figures, especially ones as well made as these. McFarlane Toys took the acquisition of this license quite serious and went above and beyond what they’ve ever done before. I’m pretty pumped to track down the rest of this wave. It looks as though Gamestop has a timed exclusivity on the first wave. However, if your local GameStop isn’t carrying these, there other options such as Amazon or Entertainment Earth.